Homemade coconut mint toothpaste is easy to make! Learn how to make your own natural toothpaste with this simple recipe. When we first became interested in natural health and simple living (many years ago), we started noticing how many chemicals we were consuming. Most conventional toothpaste includes a long list of questionable ingredients and chemicals. That list includes things like sodium lauryl sulfate, fluoride, artificial coloring and flavoring agents, propylene glycol, and triclosan. Toothpaste was one of the first things we scrutinized. And we didn’t like what we found in our store-bought toothpaste. That’s when I decided to try making my own. I prefer to know what’s in my toothpaste, and I love being able to leave any questionable ingredients out entirely. Instead of being filled with lots of chemicals, this natural toothpaste recipe is just that—all natural. I’ve been experimenting with different homemade toothpaste recipes lately. I started with making my own tooth soap, and now I’m making powders and pastes. Today I’m going to share with you the one I’m currently using. I’m very happy with this homemade coconut mint toothpaste. It’s so simple, and think this is the best coconut oil toothpaste ever! The thing about switching to natural toothpaste is that it can get expensive. Making your own is a lot cheaper than most of the natural toothpastes that are available. In fact, these are all ingredients that we keep stocked in our kitchen, so I didn’t have to buy anything to make this. If you keep these basic ingredients on hand in your real food pantry for cooking, you’ll find that this homemade coconut mint toothpaste is very inexpensive to make. How Do You Make All Natural Toothpaste? 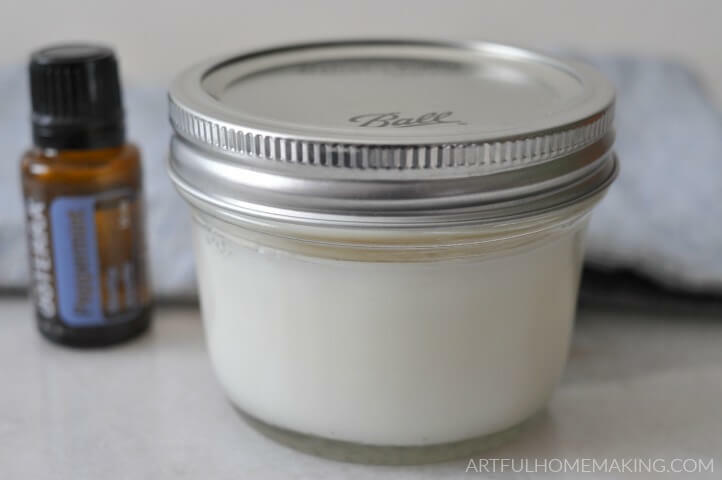 Making your own natural toothpaste is so incredibly simple! It’ll only take a few minutes to whip up. Place the coconut oil in a small saucepan over very low heat and let it gently melt. Remove the pan from the heat and add the rest of the ingredients. Stir well to combine. Store the homemade toothpaste in a small glass jar with a lid. To use, you can either dip your toothbrush directly into the jar or use a spoon. Notes: I just dip my toothbrush in this (each family member has their own jar of toothpaste). If you prefer, you could also keep a popsicle stick or a small measuring spoon near the jar and use that to scoop it out. Does Homemade Toothpaste Really Work? This post was originally published in January 2014. I updated it and added new photos. We first started making homemade toothpaste over five years ago, and we’ve been very happy with it! I was thrilled when we took our older children to the dentist (after years of natural toothpaste use—both homemade and pre-made) and they had zero cavities (my oldest is almost twenty years old, and she still has no cavities!). Don’t want to make your own? We’ve been happy with this one whenever I’m not making my own. 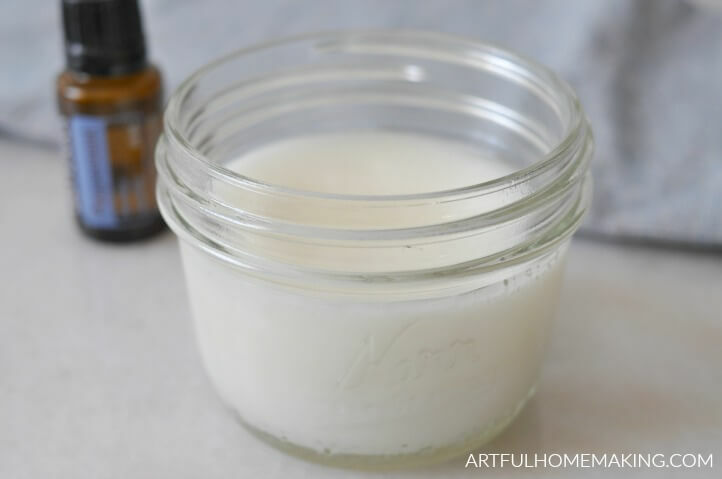 Homemade coconut mint toothpaste is an easy natural toothpaste recipe! Learn how to make your own toothpaste with this simple tutorial. Notes: I just dip my toothbrush in this (make each family member their own jar). If you prefer, you could also keep a popsicle stick or a small measuring spoon near the jar and use this to scoop it out. You can substitute cinnamon for the peppermint essential oil. optional: you can also add Bentonite Clay and Black Walnut hull powder. This post was originally published in January 2014. Post has been updated with new photos in February 2019. Thank you so much for stopping by! 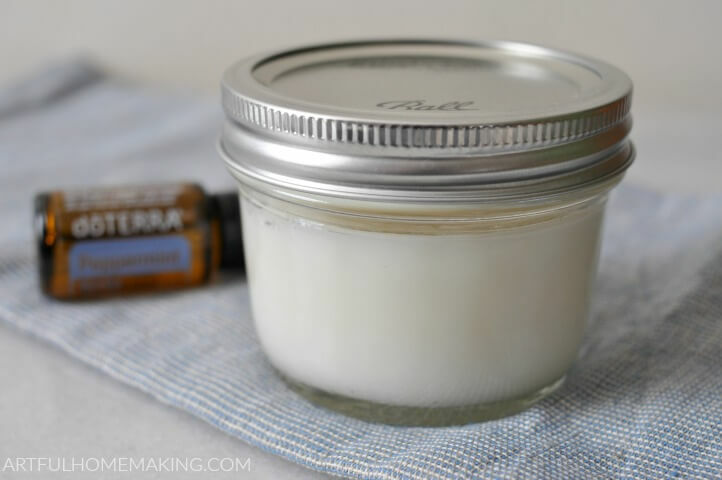 Have you ever made your own natural toothpaste? I buy an all-natural toothpaste without all the fillers, SLS, or fluoride, but I haven’t ventured out to make my own yet. It looks simple enough. Maybe I should be brave and try it. Thanks for sharing with us at #LiveLifeWell. It’s very simple to make! Thank you so much for this! I prefer to make my own but have been off the bandwagon for about a year and I would really like to get back on! I love that each person has their own! Glad it was helpful, Amy! Wow! I had no idea you could make your own toothpaste. Thanks for sharing! You’re welcome! Glad it was helpful! I’ve been looking for something like this – thanks for posting on the Homestead Blog Hop! That’s awesome, thanks for sharing, Kay! Wow! I may give this whirl. It’s frightening how much “stuff” is in our everyday items. I have to try this. I like the way it sounds know that coconut oil is great for oil pulling as well. Tooth paste is over rated and honestly hate the taste of it. Thanks for the recipe. Hey Joy! 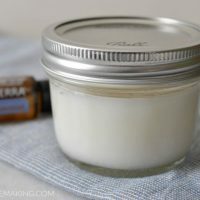 I’ve been thinking about making my own toothpaste for a while, and I’m so glad you make your recipe printable! Thank you for sharing with us! So glad it was helpful, Kristi! Coconut oil is so good for your mouth! Awesome recipe. We’ve been using it for years and love it. So glad it’s worked well for you, Lauren! I think you should mention that this toothpaste should not be spit down the sink as coconut oil can/will clog drain pipes. I am looking for another ingredient besides coconut oil to cut down on the amount of coconut oil in the recipe as I like to spit out my toothpaste in the sink. Any ideas would be appreciated! I know that can be a concern. One option would be to spit in a trashcan lined with a trash bag (which is what I do when I’m oil pulling, since it’s a larger amount of oil), but I know that’s not very desirable for many people. I do spit mine in the sink and we’re on a septic system. I just use a tiny bit of this toothpaste for brushing, and the amount that goes down the sink is smaller than the oil that goes down the sink when rinsing out a pan after cooking with coconut oil (which we do all the time). Probably the best option to avoid oil going down the sink would be to try a tooth powder or a clay-based toothpaste. I’ve been happy with this toothpowder and this brushing blend. I just wondered why mine is soooo grey? Is it normal. I’m not sure, but it could be the clay, depending on the color of the clay (some is grayish in color). In the photo above, mine doesn’t have the clay in it. You could use a different sweetener if you prefer. XYLITOL has been proven to help reduce cavities.If you are using a sweetener, I do suggest strongly that you use xylitol for its tooth health abilities. No other sweetener can give this benefit, they can only sweeten.I bought mine on amazon and it was not expensive. I would also add a good calcium powder. I use calcium citrate malate, the best calcium that the body can actually utilize properly. Thanks for the helpful suggestions, Carol! I made this recipe today following the instructions. Mine turned out very runny and hasn’t set up yet. It’s been room temp on the counter for 6+ hours. I thought it might take time to “harden up” since I melted coconut oil but there hasn’t been any change since I made it. Although it did separate a bit while sitting. My coconut oil stays mostly solid in the cabinet that’s why I thought it would harden back up a bit once cooled. But it never did. I will try the fridge. Thanks. You wouldn't happen to know the approximate self life would you? I don't have an official number on this, but it should be good at room temperature for quite a few months. Since we have several people at a time using it, ours never lasts that long. The only thing I know of that might make it not last as long is if water were to get in the jar. I've heard others say that you should use a spoon or something to apply it to your toothbrush (rather than dipping the wet brush in the jar) to prevent it from getting wet. Hope this helps! You can always buy a paste tube as well and it works wonderful. Mine doesn’t last long enough to worry about it but I have used this recipe for many years and it keeps your teeth white and your mouth fresh….really good and affordable alternative to buying it. You wouldn't happen to have an estimated shelf life would you? I have heard that you don't want to put coconut oil down your drain, but is this amount so small that it would not make a difference with regard to clogging your drain? Yes, that's true. When I was oil pulling with coconut oil I would always either spit it outside or spit into a paper towel in the trash can. But I never have had any trouble with the toothpaste since it is such a small amount. Hi Joy! I've had this recipe made up (just the oils & soda) for some time. I used it a few times as toothpaste, but somehow I couldn't handle the coconut oil in my mouth. So, don't laugh…I finally decided to try using it as a face/body scrub! A couple times a week and, oh my, it's wonderful! I just used it up and am now making some more as face scrub using lavender oil. Great post! I will have to try this ! This is the same way I do our toothpaste! I have recently been adding a bit of bentonite clay to it to draw out any impurities that we may have picked up along the way (flu season you know…) and black walnut hull to whiten our teeth. We love it! Thank you so much for the suggestions about bentonite clay and black walnut hull! I think I may have both of those items on hand, so I'll have to remember to add those. Thanks again! How much of each other those do you add? I don't really have any exact amounts…I just reduce some of the baking soda and add in the other ingredients, getting it the consistency I want. Hope that's helpful! I've have a similar recipe, but have had trouble with the paste becoming crumbly cuz our house is colder this time of year and the coconut oil solidifies. Does yours do the same? Or do you have any suggestions on how to adjust the recipe to make it work better? Good to know! I had been putting it in frosting bags to make it more like a tube of tooth paste, (zip-lock baggies tore at the tip too easily) but that only works in the summer. Right now it's so crumbly, more ends up on the counter than on the brush! I'll need to put it in individual jars so more is used instead of wasted. Thanx for that suggestion! MY mum does this but also adds a bit of olive oil to keep it a slightly runnier consistency. Not sure how much, maybe a tablespoon using the proportions you gave. Maybe try fractionated coconut oil. It won't harden. Thanks for the suggestion, Emily! How about letting it sit in warm water before using, to melt down the coconut oil? When this happens to me, I just place the toothpaste container in a cup of warm water while I wash my face. It is then usually soft enough to use when I am ready to brush my teeth.